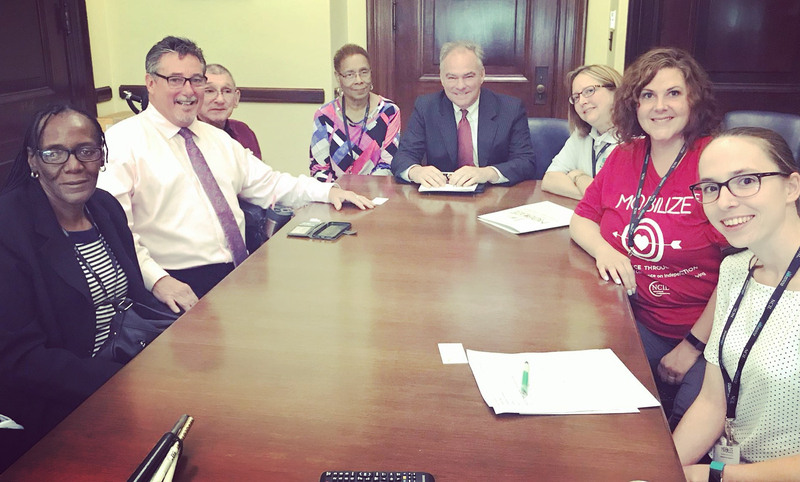 NRV DRC Office Manager, Krin Collins, and Community Advocate, Tiffany Allison, along with other Center for Independent Living advocates, met with US Senator Tim Kaine and his staff members in his Washington, DC conference room. Topics included Healthcare and the Disability Integration Act. This meeting was held in conjunction with a national conference spanning the week, and included a March through the streets of DC in support of disability rights. US Senator Tim Kaine with representatives from Centers for Independent Living (CILS) July 24, 2018 in his DC office conference room.